Mumbai, April 16: The Nifty50 on the National Stock Exchange touched a fresh record high of 11,763.20 on Tuesday as investor sentiments were boosted by a "near normal" monsoon forecast and a positive trade data. Its previous high was 11,761.00, recorded on April 3. At 9.51 a.m., it traded at 11,762.65, higher by 72.30 points or 0.62 per cent from the previous close of 11,690.35 points. Equity Indices Open in Green, Sensex Up 230 Points. 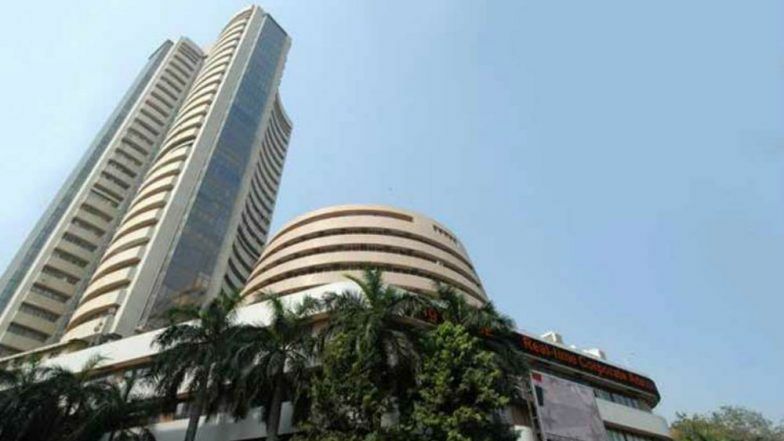 The Sensex was at 39,194.83, higher by 288.99 points or 0.74 per cent from the previous close of 38,905.84 points. It had opened at 39,040.30 and so far touched a high of 39,198.23 and a low of 39,038.81 points. The Indian Meteorological Department on Monday said that the south-west monsoon rains in 2019 will be near-normal with an expected rainfall of 96 per cent. Rise in exports from the country, also boosted the investor sentiment. India's merchandise exports grew 11.02 per cent, on a year-on-year (YoY) basis in March, to $32.55 billion from $29.32 billion reported for the corresponding month of last year, official data showed on Monday.